Spirit Airlines has announced that as of August 1, it will be the first domestic airline to charge for carry-on baggage. If you bring anything bigger than what can fit under the seat in front of you, you'll pay as much as $45. The airline's press release about it is, of course, total bunkum. The announcement isn't framed as the consumer-robbing precedent it is but as a reduction in bag fees, since checked bags will now cost $15. It also tries to pawn off the new carry-on charge as a bargain, saying it's "only $20". But, wait -- that's not the whole truth! Look closely, and you'll see that you have to be a member of the airline's "$9 Fare Club" to get those rates (an annual membership costs $40), and you have to pre-book online. The rest of us pay $10 more for each, or $30 for hand baggage and $25 for checked luggage. It gets worse. That's for online reservations. Register a carry-on at the gate and the general public is walloped with a $45 fee per bag, each way. If it's larger than 16 inches by 14 inches by 12 inches, you're going to pay. The press release is so Orwellian it makes your skin crawl. "In order to continue reducing fares even further and offering customers the option of paying only for the services they want and use rather than subsidizing the choices of others, the low fare industry innovator is also progressing to the next phase of unbundling with the introduction of a charge to carry on a bag and be boarded first onto the airplane." At the same time, Spirit will sell the first seats of its flights for very little -- Penny Plus, they're being called. If you were one of the first few people to book the flight (good luck with that), the airline says you'd pay a sample fare of $55.20 from Detroit to Fort Lauderdale: 1¢ for the fare, $36.49 for fuel, and $18.70 for taxes and fees. Already, as you can see, that "Penny Plus" name is intentionally misleading, because no other airline separates the cost of fuel from the fare. Even in this best-case scenario for the Detroit-Fort Lauderdale, the true fare, including fuel, is $36.50. Plus taxes, plus fees, plus the cost of your carry-on ($30) and checked baggage ($25), one-way flights actually start at $110.20, which isn't that far from the normal cost of the flight -- if you happen to be the first to book it, anyway. There's a lot of "plus" on top of that penny. Most times, the price will be even higher than that. Spirit Airlines' mathematical sleight-of-hand can't change the facts, although there will be many consumers who will be fooled. One thing that is unchangeable, though, is the fact a major American airline has finally broken the seal, and charged us for hand baggage. If you don't like it and you don't want to see more of it, now's the time to vote with your dollars. Clearly, Spirit is stealing Ryanair's playbook, which is sad for the airline, because it's a dirty playbook. Ryanair, a large but nonetheless reviled European airline, already charges for the second carry-on bag. It's also famous for being dishonest about the true cost of a trip and mounting tasteless publicity stunts, such as threatening to charge passengers to use the lavatory. Spirit, too has been tasteless in the press, by taking out crass, sexually suggestive ads. 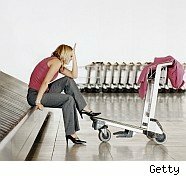 When airlines began charging for checked bags, it caused a logjam in the overhead bins and alienated longtime customers. It's a mess of the industry's own doing, and now they're compounding the burden on your wallet and your stress levels by charging for that space as well. In theory, it's defensible, since it will ostensibly free up cabin space. But in reality, it's a further complication to our travel budgets and our lives. Bringing as little as possible has always been a time-proven tip for successful and cheaper travel. But to save money on Spirit, passengers now pretty much have to sit empty-handed, facing forward, bored out of their skulls. George Hobica, president of Airfarewatchdog.com, issued this forbidding protest, which alludes to Ryanair's other greedy charges (such as $60 for boarding passes) to sum up the slippery slope we're now on: "When will we finally see a US airline dare to charge for using a credit or debit card, and who will be the first to eliminate airport check-in counter staff, forcing passengers to show up at the airport with a pre-printed boarding pass and pre-paid luggage fees, then proceed to a conveyor belt, show their fee payment, and drop their bags themselves on a conveyor belt - and proceed to the gate[?] No human interaction necessary." It's another case of the quality of a product being eroded to the very minimum that customers will accept. Anyone who offers the image of crowded planes as a justification for this deterioration in our expectations is only giving the airlines an excuse for whittling away more of them. If you don't want to pay for your carry-ons on other airlines, too, then now's your moment to speak out: Put your money where your future is. Don't fly Spirit Airlines.